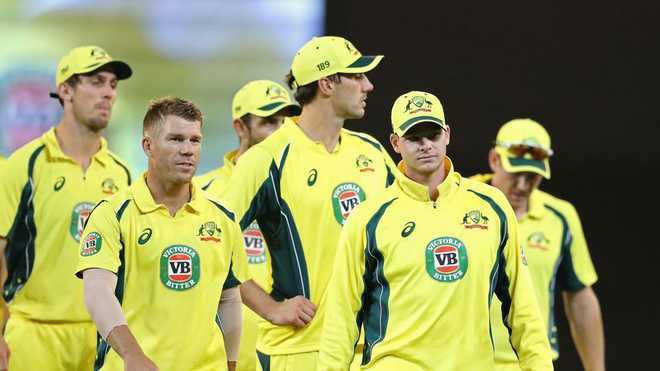 Canberra: Cricket Australia on Monday announced the 15-member squad for the upcoming ICC Men's Cricket World Cup in England and Wales starting May 30. Steve Smith and David Warner have returned to Australia's ODI squad after their ban. Former captain Smith and Warner have not played international cricket since their ban following a ball-tampering incident in Cape Town in March 2018. Currently, the duo is playing in the Indian Premier League for their respective franchies i e SRH and RR. However, there were a few surprise in the selection as fast bowler Josh Hazlewood and in-form batsman Peter Handscomb were overlooked. Peter Handscomb was omitted despite having played each game in both of Australia's recent series against India and Pakistan, and 26-year old all-rounder Ashton Turner has also missed out on squad, having made his ODI debut in March. Australia have named two spinners in the squad in Adam Zampa and Nathan Lyon alongside a five-strong pace arsenal of Mitchell Starc, Pat Cummins, Jason Behrendorff, Jhye Richardson and Nathan Coulter-Nile. Glenn Maxwell and Marcus Stoinis make up the all-rounders and Alex Carey is in as the lone wicket-keeper, while Shaun Marsh, Usman Khawaja and captain Aaron Finch complete the 15.